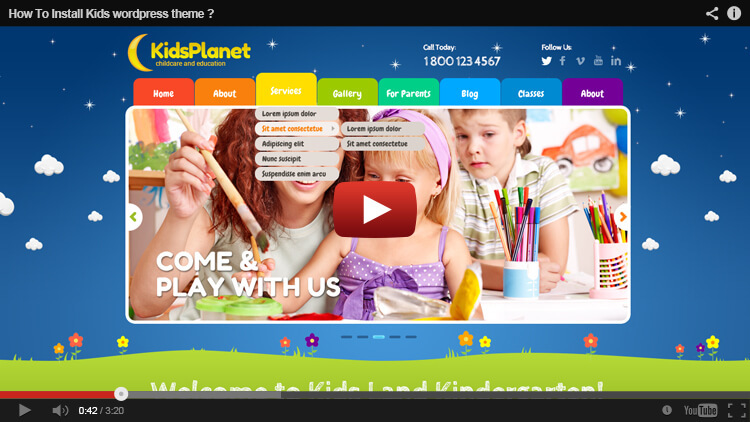 Presenting our latest kid’s WordPress theme, this kindergarten theme is your entrance step on the off chance that you are planning to have any activity related with children, for example, kids minding, child's classes or other. This excellent and vivid site is made only for your business. Beginning with a beautiful menu bar that incorporates diverse administrations for your client, for example, Home, About, Services, Classes, Gallery, Parents, Blog and Contact. At that point comes our lovely slideshow which compresses the diverse administrations that you offer, all joined by HD pictures that are all included when you buy our template. After that, it is our excellent four cards format which essentially has as the main thought to upgrade your client with your latest movement. We made it intentionally for it to be with common hues which pull in children and their guardian and let them know about the pleasure that they will experience with your administration. We divided this part into four different sections that are all subject to change according to your preferences. Toward the end, we will furnish you with one passage called Why choose kids planet, to clarify your central goal, your administrations and how child's life may change while enlisting in your administration, and finally update your most recent news. To wrap things up, our formats bundles incorporate 1 month of free host account at www.m9host.com site. Adding that cost to the free pictures that are incorporated into our formats, we are pleased to be your least expensive pathway all through a fantastic effective business. HOW TO INSTALL KIDS WORDPRESS THEME ? what you mean under source code in WordPress, I know source code for HTML or bootstrap template but for WordPress what you mean? I sent invitation to manage my account AND I sent in email my cpanel login credentials so you can log in directly in my hosting account. Dear customer, we do not know what you sent but we didn't receive information which needs for installation. Please again send us following information: your hosting cPanel address, username, password, your site url address, name of folder where would you like to install template. There are only 3 comments here in the month of December and they are all from me! You asked for information, I sent you the information to the email address you provided... then I explained what I sent, because I did not get response from you. So I am confused by your question "what you sent?" but we didn't understand what you sent, we asked you to send us your host information, you sent invitation or what ???? Can this theme work with RTL languages? Also, can we add instagram instead of pinterest? In Oman they use instagram extensively. Hello, I have already instaled Worpress on my server. Haw can I install your theme without installing Wordpress?